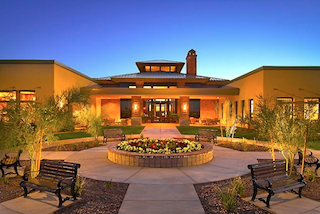 Sun City Anthem at Merrill Ranch in Arizona is a resort-style 55+ community with budget-friendly homes. Living in an amenity-rich active adult community doesn’t have to mean passing up a budget-friendly home. There are many communities throughout the country where residents can find affordable homes as well as resort-style recreations like fitness centers, swimming pools, sports courts and special-interest activities. Here are ten great budget-friendly active adult communities. Just 40 miles north of San Bernardino, Sun City Apple Valley is a Del Webb community which welcomes residents age 55 or better with affordable homes, two spacious clubhouses and a wide variety of special-interest clubs and social activities. Its prime location combines picturesque mountain views with easy access to shops, restaurants and services in nearby Apple Valley, Victorville and Hesperia. Southern California’s Four Seasons at Beaumont is a gated, age-restricted community which offers an active adult lifestyle in the heart of Riverside County. Opened in 2005, this K. Hovnanian development features both new construction and resale homes in a range of styles and prices. Diverse amenities are found throughout the community, including a private on-site restaurant, hobby and game rooms, multipurpose social areas and outdoor recreations. Sun City at Merrill Ranch is a fabulous choice for active adults who dream of a more rural retirement. The community is set 60 miles from Phoenix, where it enjoys open spaces and spectacular scenery. Available amenities include an impressive 48,000 square-foot clubhouse, outdoor sports courts and the 18-hole Poston Butte Golf Course, which winds throughout the development. Single-family homes are available on both a resale and new construction basis. In the heart of the Sonoran Desert Valley, CantaMia is a newer 55+ community which opened in 2010 with plans to one day contain about 1,700 homes. Activities within this gated community are centered around the spectacular CantaMia Village Center. Here residents will find a state-of-the-art fitness center, hobby and game rooms, social areas, a demonstration kitchen and many other resort-style amenities. Located in Reno, Sierra Canyon boasts affordable resale and new construction single-family homes, a 20,000 square-foot clubhouse and a mild four season climate. Beyond the amenities in the enclave’s own Aspen Lodge facility, residents have access to recreations in the larger Somersett community including its private 18-hole golf course. Somersett also offers a range of retail stores and an inviting village center. 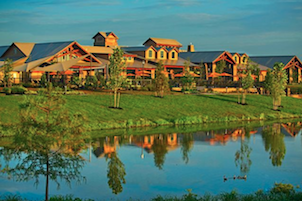 Del Webb Sweetgrass is a new 55+ community near Houston, Texas with homes from the mid $100s. Opened in 2011, Del Webb Sweetgrass is a newer community which welcomes residents age 55 or better. Its picturesque setting in Richmond includes a 50-acre lake, a natural creek and miles of walking trails, yet the community is also within easy reach of the urban attractions in Downtown Houston. A spacious clubhouse offers on-site amenities and a full-time Activity Director maintains the diverse social calendar and supports the famous Del Webb lifestyle. With plans for about 730 homes, Cresswind at Lake Lanier is a mid-sized 55+ community with spectacular amenities and a prime location on the shores of Georgia’s fabulous Lake Lanier. In addition to its amenity-rich 36,000 square-foot clubhouse, the community boasts a marina and private boat dock, an outdoor amphitheater and beautiful single-family homes in a range of styles and sizes. Just 25 miles northwest of historic Charleston, Del Webb Charleston provides Southern charm combined with resort-style living. This gated community is set on 360 acres of landscaped terrain and wetland preserves. The development features an amenity-rich clubhouse and a variety of outdoor recreations, including sports courts, a dog park and a fishing lake. Upon completion, Del Webb Charleston will contain about 1,000 affordable single-family homes. Although it includes a 60,000 square-foot recreation complex and plans for 4,000 homes, Stone Creek has maintained an inviting, small-town feel in the midst of the popular Ocala area. This Del Webb community supports an exciting active adult lifestyle with a wide range of resort-style amenities, outdoor recreations and an 18-hole championship golf course. Its low-maintenance homes are available in both single-family and attached home designs. Set within the larger Ave Maria community, Del Webb Naples is an age-restricted enclave which boasts fabulous amenities including a new 36,000 square-foot clubhouse and the 18-hole Golf Club at Del Webb Ave Maria. Beyond the exclusive amenities within Del Webb Naples, residents also have access to the many recreations within Ave Maria, including a Mediterranean-themed town center with shops, restaurants and other services.